Gabrielle is TJL’s very own Leonardo da Vinci. A true polymath, she holds a master’s degree in Common Law and Transnational Law (LL.M.) and a master’s degree in Molecular Biotechnology and Law (M.B.M.D.). 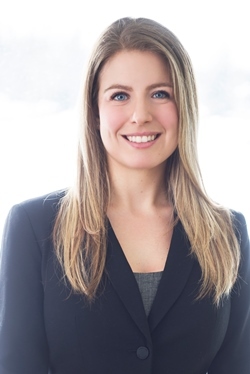 A member of the Québec Bar since 2012, her career started at a high level with her immediate immersion in the trial of the class action against the tobacco companies. She was soon navigating through expert reports in otolaryngology and epidemiology like a fish in water. Her tenacity became legendary: Gabrielle only missed two of the 251 days in court over three years. Self-taught, she built a database to structure and prioritize the 43,000 exhibits. She is just as methodical with recycling and composting in our offices and does not hesitate to remove “evidence” from our bins. When we need expertise in documentary management of complex class actions or want to know if our coffee cup is recyclable or compostable, we turn to Gabrielle. In addition to cases requiring a scientific background, environmental issues are particularly important to her. In that vein, Gabrielle completed an internship at Bioversity International, an international agricultural research organization based in Rome, from 2009 to 2010. She naturally took advantage of this experience to add Italian to her linguistic toolbox. Finally, Gabrielle is passionate about defending the rights of sexual assault victims, and she does so with sensitivity and empathy. With Mr. Johnston, she leads the class actions against Gilbert Rozon and the Diocese of Chicoutimi on behalf of the many victims.